You are here: Home » DON”T LEASE SOLAR! It’s a HUGE mistake! Did you know that about 85% of the solar companies doing business in California LEASE their solar systems? That’s absolutely HORRIBLE! Let me cut right to the chase here and save you a lot of time … and a ton of MONEY! Leasing is only good for one party and guess what – it’s not the homeowner. The only people benefiting from a LEASE are the venture capitalist and investors who are anteing up the money to fund them. What do they get for their efforts? First off, they charge a huge processing fee. It’s conveniently buried in the contract and it’s well north of $2500, depending on the system size. But wait, there is more! They also take the depreciation of the money to boost their bottom line profits, pocket your 30% Federal Tax Credit, and claim any utility rebate that may be available. And what does the homeowner get? Depending on the lease, you might get a positive cash flow of $10-$50 per month. And to do that, the homeowner needs to sign an iron-clad 29-page contract with a leasing company. It should be regarded as more of a legal document than a homeowner-friendly investment agreement. Does that seem right to you? It shouldn’t! To top it off, you’re going to pay for a leased solar system for the next 20-25 years (depending on the lease) and still OWN ABSOLUTELY NOTHING! Based on that ugly scenario, why would you change from your local utility? You’ll pay them forever also, and never own anything! The difference is at least you know how to find an 800 number for your utility if you have a problem. Good luck on finding the solar lease company which is bound to be out of business in a few years. Then to top it off, at the end of the lease, the leasing company is going to try to sell you the solar system. So that means after 20+ years, you will have to pay something they describe as “Fair Market Value” to continue to use THEIR solar system. Does any of that seem remotely fair to you? It’s NOT! In reality, a solar electric system should be regarded as one of the best home improvements that one can ever make to their home. A system that reduces your annual utility bill exposure by $1000, can add $20,000 to your home value (source: HUD). That’s a serious Return on your Investment! But only if you purchase and own it! By comparison, a leased system adds nothing to the home value – ZERO, ZILCH, NADA! In fact, if you sell your home, you have to hope that the next owner wants a leased system; and two, qualifies financially to take over the lease. Otherwise, you have major issues. Once again, Solar Ownership is the only way to go! To put that in perspective, let me put it a different way … Would you consider leasing a swimming pool? NOPE! How about a room addition, or new windows? NOT HAPPENING! It doesn’t make sense, correct? Now, hopefully, we are on the same page! Don’t pay a bunch of excessive fees! Keep your 30% Federal Tax Credit and pocket your own rebate money! Then power your own home, with your own power plant, and purchase power from yourself. Most homeowners pay off and own their solar system in just five-six years. Worse case scenario, you’ll have your system paid off within 12-years and all electricity from that point on is FREE! 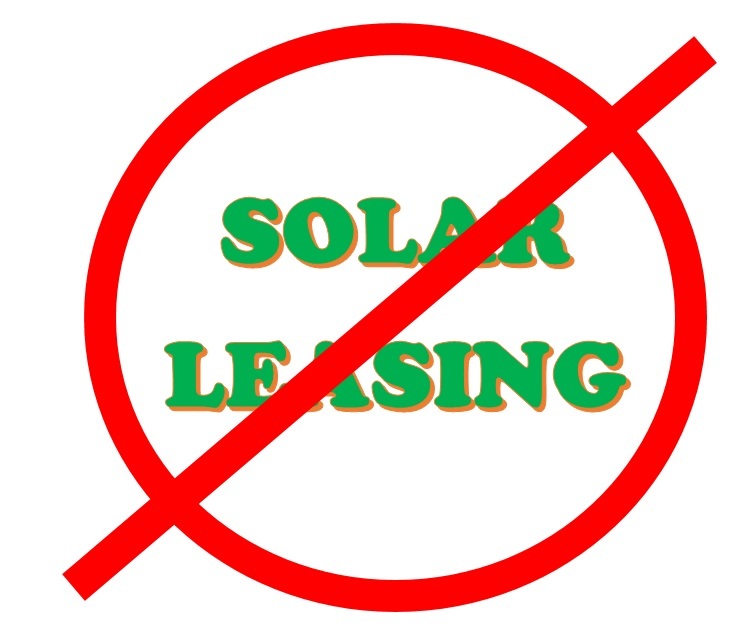 Don’t ever consider leasing a solar system (you’ll thank us later!) You would be making a huge mistake! ← Lock in your 2013 Solar Tax Credit immediately! I wish I would have read this before I leased my solar system from someone else. Now I know I made a costly mistake. This is probably the best explanation I’ve ever read about leasing a solar system. My brother-in-law and a cousin both leased their system through Solar City. When they explained how the financial arrangements of how their leases worked, it sounded more confusing than promising. However I didn’t know how to figure it out until I read this. thanks.